As much as I believe in the importance of journalism, I know I don’t have nearly the impact on people’s lives that my brothers do. As I noted last year after the death of my nephew, Brandon, my younger brother, Don, and his wife, Pam, have adopted 11 children after having three biological children (Brandon was the second-oldest adopted child). I also have mentioned before that my older brother, Dan, is a peace missionary, both here and on the travel blog I share with Mimi. 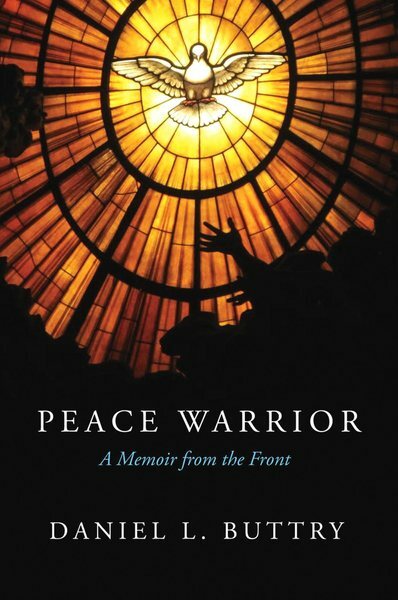 Dan’s memoir, Peace Warrior, came out last month and I just finished reading it. Dan tells about his work teaching and practicing peacemaking around the world — from Burma, Georgia (Tbilisi, not Atlanta), Liberia, Nagaland, Bosnia, Ethiopia, Nicaragua, Congo and on and on. I sometimes think I’ve seen a lot of the world as a journalist, but Dan has seen much more of it as a peacemaker. And he’s had more profound impact. If you’re interested in world affairs or Christian missionary work or peacemaking, you might enjoy the book, though I don’t pretend to be a fair judge of it. I enjoyed it, of course, for other reasons. In a way, I was catching up with a brother whose exploits I’ve heard and read before (actually, I scanned his reports from his various travels more often than I read them) but mostly followed from afar. We visit a few times a year and I knew much of the story but the memoir told many details I missed or had forgotten. I’ve understood for decades the depth of Dan’s calling and commitment to peacemaking, but the memoir added greatly to that understanding. I generally blog about media and journalism issues here, so I won’t focus on Dan’s peacemaking efforts but on a few of his occasional references to media coverage of the conflicts he became involved in. As a journalist, it was interesting to read an activist’s perspective on media coverage (or non-coverage). We also learned a lesson about media coverage when hundreds of us shut down a major bank building in downtown Boston for a whole day because that was the location for the regional office of the Central Intelligence Agency. Throughout the day thousands of people walked past us or dealt with the inconvenience of the closure of the bank and all the offices in the building. But that night the news was filled with the U.S. bombing of Libya, and our story was not even covered in the local news. It seemed as though deliberate decisions had been made to minimize the news coverage of our actions. We would have to find our own ways to tell the story about peacemaking rather than trusting others to tell it for us. I know nothing specifically about decisions made by Boston news media on that particular day. But I can confirm for Dan (to my own chagrin and disagreement now and at the time) that I have worked in newsrooms that had specific policies to minimize news coverage of protests. In fact, I thought the policies often overrode good news judgment. I have written twice before about my preference for denying media coverage to attention-seekers who picket soldiers’ funerals and to mass murderers. But I was always troubled by editors’ decisions to downplay (or refuse to provide) coverage of protests against actions or decisions of the government. This nation was founded in protest and the right to protest is protected in the First Amendment, along with our right to publish. I always found arbitrary decisions — and especially policies — not to cover protests or to minimize coverage of them offensive and even un-American. Not that I would cover every protest. A small protest might merit no coverage or just a brief. Continuing protests might not deserve daily coverage. My view is that coverage decisions for protests against government policies or actions should be made using good news judgment about the facts surrounding that protest, rather than following arbitrary policies. Most protests are more newsworthy than editors have thought for much of my career (I think that view is less prevalent today) and less newsworthy than the protesters think (yes, they are attention-seeking and I don’t want to give them undue attention). Sound news judgment should prevail. If a protest shut down a major downtown building, as Dan described in the Boston protest, that was news and those people who were inconvenienced by the protest (or amused, annoyed or inspired) no doubt looked to the news media to see what was going on, and they got no answers. That was bad journalism, even if Dan and his fellow protesters were obviously seeking attention. But here’s the most important part of that passage to me: Dan’s conclusion that the protesters would have to tell the story themselves. This was in the 1980s, before blogs and social media made it easier for non-journalists to tell their own stories. The editors who showed bad news judgment in failing to cover an event in their community were abusing their gatekeeper power. But, as I noted last year, the fences have blown away, so the gatekeeper role is far less relevant today. That’s not just because of technology but because we abused that role. A trip to Nagaland was organized for Indians to see what was going in within the borders of their own country and to learn directly from the Naga people about their plight instead of hearing everything through the filters of the Indian media. Reporters were also kept out of the region, sealing off an already-remote region from the attention of the world. This was perhaps the most remarkable thing about Dan’s book to me, how little attention most of the world has paid to many of the wars (mostly civil wars) Dan has been involved in. The war in Bosnia got huge attention. And the war in Congo has received some attention lately (but not commensurate with its status as the most deadly war since World War II). But scant attention has been paid to the war in Nagaland, continuing strife in Burma or the Rose Revolution in Georgia, perhaps the three nations where Dan has spent the most time and effort. I had argued with Muivah (a leader of a Naga faction) that the sporadic violence of the Naga insurgents was so mundane and forgotten by the world that his actions would garner little attention. On the other hand, a massive boycott and nonviolent witness would be of interest to a major global media outlet like the New York Times, which was running frequent articles on the Indian parliamentary elections. I was wrong. In spite of the fact that I sent press kits with background and contact information to the New York Times, BBC, CNN and many other press organizations, nobody picked up the story of the Naga protest. There’s some more attention-seeking (but unsuccessful) behavior. Think about this the next time you hear conservatives whining about the supposedly liberal press. For most of his peacemaking career, my bleeding-heart brother has been ignored by the press. But my son Mike, who spent much of his career seeking attention for a conservative U.S. senator (Chuck Hagel, who was and is conservative, despite the furor that Republicans raised over his nomination as defense secretary) regularly found willing reporters. The summit got off to a rough start with the media almost immediately. No Kansas City gangs were involved with the summit because there were no truce efforts underway there. The major Kansas City paper ran a front page article questioning whether such an event could produce anything good, accompanied by a photo of Kansas City gang members posing with armaments that would delight a liberation army. The summit leaders were furious and took action. First, because they saw the media as unsupportive of their efforts, leaders banned the media from the rest of the summit. Second, they sent a delegation to the local gangs pictured in the paper to tell them that they didn’t know anything about what was going on and inviting them to join the summit meetings. Out of that invitation came one of the strongest on-going metropolitan gang peace initiatives in the whole country. I found this episode interesting for more than the Kansas City connection. Of course the story and photo angered the summit leaders, but it also pointed out a valid oversight on their part, an oversight they addressed immediately, with positive results. The coverage they viewed as negative was totally legitimate and had a positive impact on the mission of the event. Dan doesn’t say whether or how soon the Kansas City community learned of those positive results. With the media banned in a fit of pique, the summit leaders might have deprived themselves of coverage (or at least delayed coverage) of the local gang peace initiative that grew from the conference. This is a common viewpoint and reaction by people of a variety of social and political viewpoints: that the media should be “supportive” of whatever they’re doing. We don’t support; we report. If we’re doing our jobs well and you’re running your event well, our coverage will feel supportive. But if you screw up (and not inviting the local gangs was a significant screw-up), we’ll report that, too. But reporting screw-ups is not always bad (and wasn’t in this case). A picture of me and one of the Muslim young women beaming at each other with our hands over our hearts was splashed across the Detroit Free Press along with photos of Christian and Muslim clergy standing side by side. Jones came and did his thing, but he ended up as the side story instead of the main feature. We successfully seized the initiative and controlled the prevailing message. While I think many journalists would squirm a little at Dan’s frank language about attempting to manipulate the media, people try to manipulate us all the time (and Terry Jones has manipulated the media masterfully). We should listen to the people pitching stories to us, even if they don’t have press secretaries who are among our regular sources. But we should also seek out people who should be part of the story but aren’t sophisticated enough to manipulate us. And we should exercise good news judgment, which it appears the Detroit media did in this story. A good reporter needs to milk a lot of cows, too. But the cheese should be ours (and we should credit the cows). Don’t be surprised if I steal Uncle Frank’s line sometime. 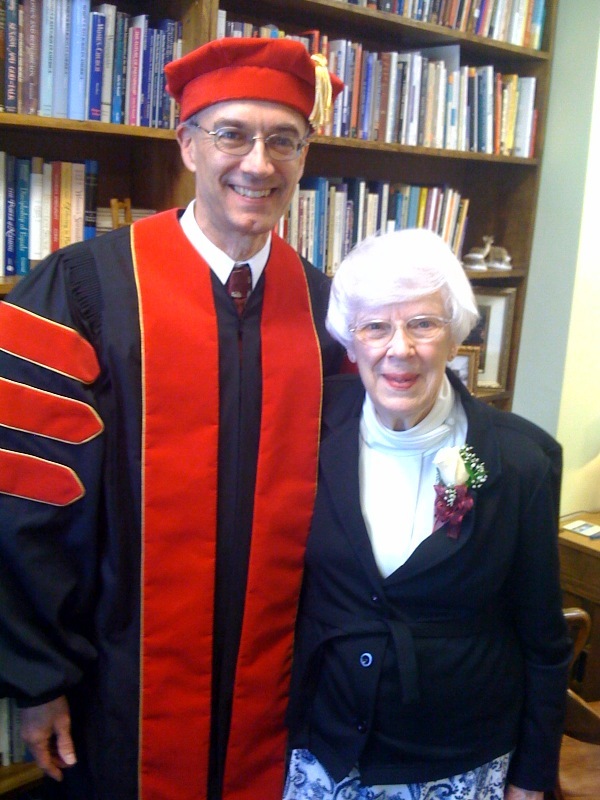 Dan posing with our mother, Harriet Buttry, before receiving his honorary doctoral degree from Central Baptist Theological Seminary. That made me laugh, and not just because I remembered Mom saying that hundreds of times. But the glancing mention, without even a name, was actually quite an accurate reflection of my place in Dan’s peacemaking work. I’ve never witnessed one of his conflict-resolution workshops or accompanied him in his travels. I think the only event relating to his peace ministry where I’ve been present was in 2009 when Central Baptist Theological Seminary recognized his work by giving him an honorary doctoral degree (that honor didn’t make the memoir, except a brief mention in the timeline that is an appendix). 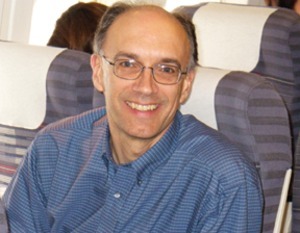 If I write a memoir of my journalism career someday (nothing in the works), Dan would likely have a cameo appearance at the most (as a religion reporter at the Des Moines Register, I covered a contentious American Baptist convention in Des Moines where Dan was present). We’ve followed vastly different career paths (though both involve teaching and writing), but I admire his work and found his observations about the media interesting. 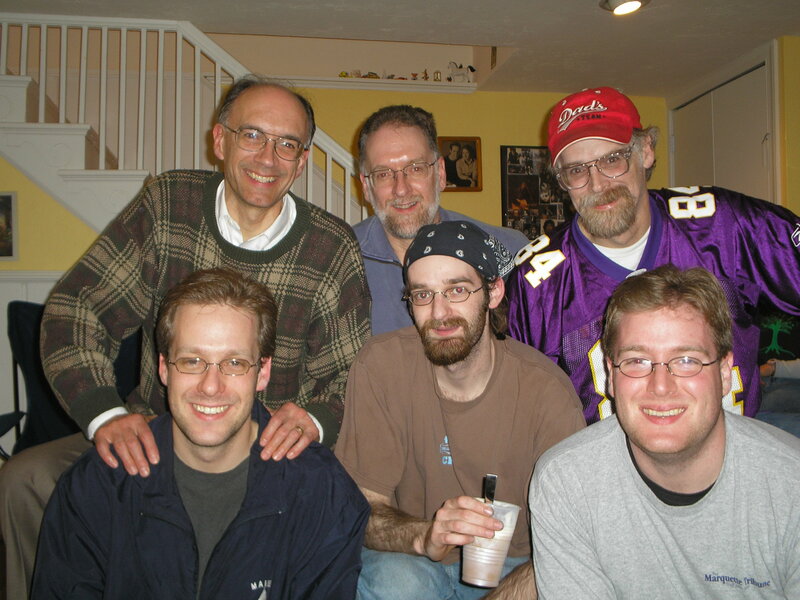 Two generations of Buttry brothers gathered in 2006: Back from left, Dan, me and Don; front, my sons Mike, Joe and Tom. Have you discussed this aspect of the summit leaders’ pique with your brother?